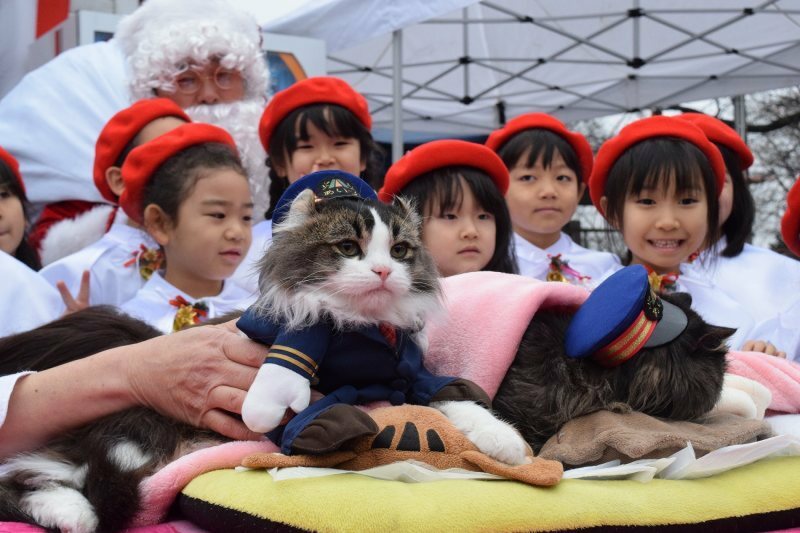 AIZUWAKAMATSU, Fukushima -- A local railway company has appointed a new feline stationmaster at Ashinomaki Onsen Station here as its honorary stationmaster cat "Bus" was retired from her post. A ceremony was held at the station on Dec. 24 to reward Bus for her years of service and to officially announce her successor, "Love." Bus was a stray cat and was taken in by the station staff 16 years ago. She became popular among locals and became the honorary stationmaster in 2008. Bus is estimated to be at least 17 years old and was recently often seen sleeping inside her office. The new stationmaster, a 20-month-old male cat, has been raised by a station worker to succeed Bus.